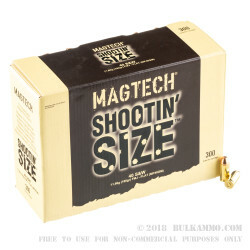 This 40 S&W cartridge from Magtech’s Shootin' Size line of ammunition features a 180 grain projectile. The bullet sports a full metal jacket, making it optimal for repeated firing during lengthy target shooting sessions as it will help prevent lead residue from fouling up your bore’s rifling. 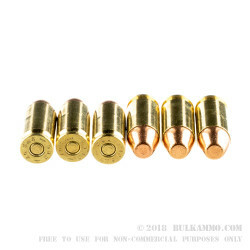 This bullet additionally offers a flat nose, which is perfect for shooting paper targets as the hole it makes is easily visible down range, and also neat enough to facilitate scoring in a competitive shooting match. 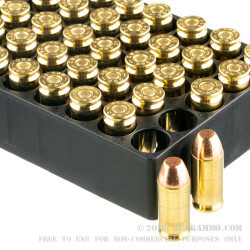 This cartridge has a non-corrosive Boxer primed brass casing, so you will be able to reload it for several more trips to the range in the future. Magtech prides themself for their timely, state of the art, and high quality ammunition solutions that they present to shooters. Their Shootin' Size line of ammunition gives shooters affordable cartridges with which to hone their skills, but without having to shell out enormous wads of cash in return. Shooting size is right. Two Glocks- 22 and 27 love it; no jambs and clean after 300. She unloads a clip as fast as she can so bulk ammo is a friend for life.